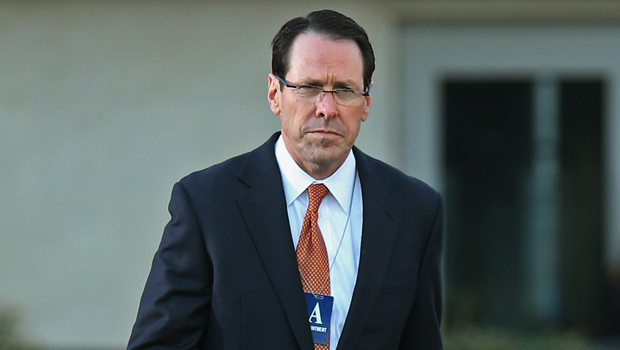 NEW YORK AT&T (T) CEO Randall Stephenson earned $21 million in 2012, a personal record, as his pay bounced back after a less than stellar 2011. The phone company's board lopped $2.1 million off Stephenson's pay in 2011 because he engineered the failed deal to buy T-Mobile USA (T). Opposition from regulators meant AT&T had to abandon the project and hand over $4.2 billion in cash and spectrum rights to T-Mobile. That was a forgotten in 2012, when Stephenson's pay was back in line with previous years, plus a little extra - his total was 4 percent higher than the $20.2 million he earned in 2010, according to a calculation by The Associated Press based on a regulatory filing Monday. Stephenson's pay last year included a salary of $1.55 million, a bonus of $6.06 million and $12.6 million in shares. Personal use of the company's aircraft was worth $276,391, and the company paid for $101,923 in home security for him, which was included in $803,308 in other compensation he received. The AP's compensation formula doesn't include changes in the present value of pension benefits, and its total sometimes differs from the totals that companies list in the summary compensation table of proxy statements filed with regulators. In 2012 Dallas-based AT&T earned $7.3 billion, up 84 percent from $3.9 billion in 2011. Revenue rose 0.6 percent to $127.4 billion.